MAY 20, 2015 UPDATE: Today Los Angeles Superior Court Judge Lauren Weis Birnstein dismissed the two remaining misdemeanor police interference counts against Leon Rosby, the Daily Breeze reports. “An honor to represent you Leon and get justice for Max,” Rosby’s attorney, Mark Garagos, tweeted this afternoon. 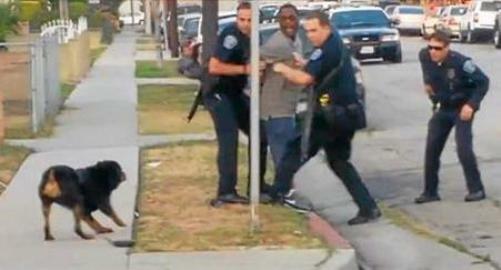 A trial finally began two weeks ago regarding the infamous 2013 case of a Hawthorne, Calif., police officer shooting a Rottweiler named Max as the dog’s owner, Leon Rosby, begged him not to. But it wasn’t the police officer who was being tried. It was Rosby, who was charged with dissuading a witness and two counts of interfering with a police SWAT operation. The jury deadlocked on the police interference charges, but found Rosby not guilty of dissuading a witness. “Thank you. Thank you,” Rosby said in tears when the verdict was announced Monday at the Airport Courthouse in Los Angeles, the Daily Breeze reports. Eight of the 12 jurors were in favor of a not guilty verdict for the police interference charges as well. Judge Lauren Weis Birnstein declared a mistrial on those two counts. Rosby will return to court April 7 to find out if prosecutors want to retry him or dismiss the charges. Back in June 2013, as Rosby drove home from a dog park with Max, his 3-year-old Rottweiler, he stopped to check out a police barricade situation. With Max on a leash and music blaring from his car, he walked over to make a cellphone video. According to the Hawthorne Police Department, he got too close. Officers told him to turn down the music volume in his car and leave. Rosby returned to his car and put Max inside. When two officers following Rosby put him in handcuffs, Max leaped out an open window and ran at the officers, barking at them. As Max jumped toward an officer, he was shot four times. A few days after the first shocking video of the incident was posted on YouTube and viewed by millions, another video surfaced, taken by a witness from a different angle. The Hawthorne Police Department said the second video proved the officer had good reason to shoot Max. Rosby is accused of intimidating witness Kathy Brown after she told police that Rosby had threatened the man who recorded the second video. Brown later changed her story, saying she had lied about Rosby’s threats. “It was hard to take anything she said as being the absolute truth,” one of the jurors, Colin Lopez, told the Daily Breeze. Rosby was represented by Mark Geragos, whose name you may recognize from cases involving Michael Jackson, Chris Brown, Winona Ryder, Scott Peterson and many others. He told the Daily Breeze he expects the police interference charges will be dropped.